One of our most popular and affordable panels Tuff Rib is a jack-of-all-trades for metal roofing, siding, and modern accents. Originally designed for traditional and agricultural buildings, Tuff Rib is built to last and stands up to wind, hail, snow and rain. Finish it off with a sleek-looking trim and this panel shines as a residential roofing system. Install the panel horizontally as a wainscot and you’ve got a modern-industrial accent that makes your project stand out. You can count on Tuff Rib to work hard on the ranch, take care of business on commercial builds, or protect your family from the elements. This panel has you covered. This commercial space uses Tuff Rib for exterior wall siding. The Montana Raptor Conservation Center uses Galvalume Tuff Rib for their flight barn. The Cool Roof System on this commercial space is Tuff Rib in Parchment. Dark Gray Tuff Rib used in a commercial exterior project as metal siding paired with natural wood siding. This commercial building uses horizontally ran black Tuff Rib siding. The exterior of this home uses Dark Gray Tuff Rib roofing with A606 Weathering Steel 7/8” Corrugated siding. This commercial space uses Tuff Rib siding for gables, siding, and wainscot. This garage uses Tuff Rib as exterior roofing, siding, and wainscoting. The siding on this distillery is Dark Gray Tuff Rib. The exterior of this home features Dark Bronze Tuff Rib on the wainscot and deck fencing. The entryway to this brewery use Copper Penny Tuff Rib siding. The exterior of this commercial space uses Desert Brown Tuff Rib and ½” Corrugated in Galvalume. Tuff Rib roofing is used to complete the look of this barn. Suitable for regions prone to hail. Suitable for Solar Panel mounting. Available in Cool Roof certified colors. 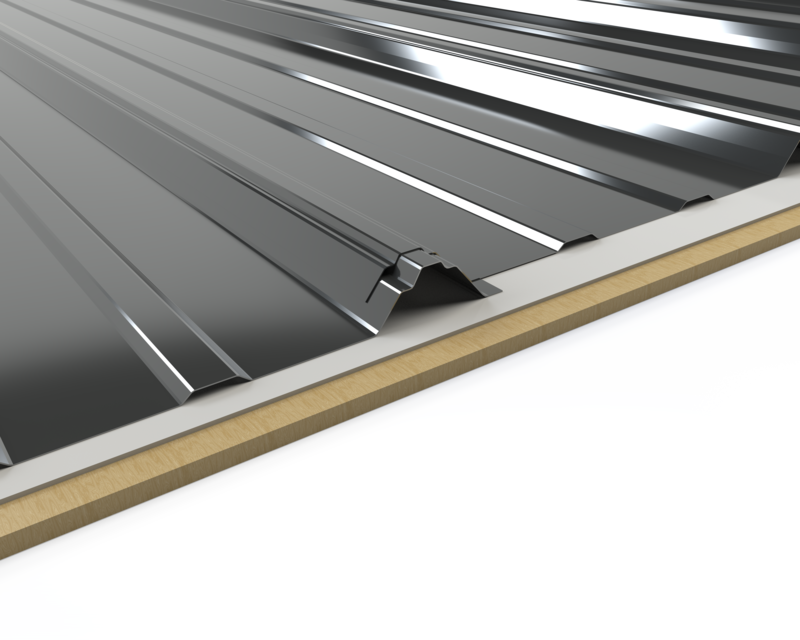 Can be installed over an open purlin system or a solid substrate. If used for a roofing application, use bead mastic on the overlap. A quality high temperature, ice and water underlayment on all roofing applications is recommended. Anti-Siphon Groove: Creates an internal air gap at panel overlap to help prevent water intrusion. Underlayment: High Temp Ice & Water shown in overlap. For use at eaves and valleys. Substrate: Plywood substrate material shown. Can be used over open framing.